Stephanie Connell gets to play with some of the coolest collectibles on the planet. As an Entertainment Memorabilia Specialist with Bonhams in London, she spends her days casting her critical eye on James Bond movie posters, Beatles merchandising products, and costumes worn by the various actors who have played Doctor Who. In this interview, Connell tells Collectors Weekly which actors are most sought after by collectors, recalls some of the most interesting items she’s ever listed for auction, and explains how a film’s cult status can impact the value of its related entertainment memorabilia. 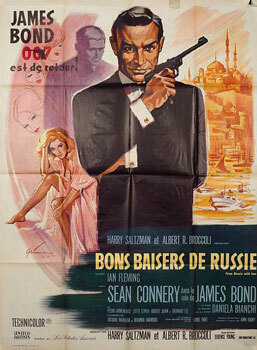 French movie poster for From Russia With Love (Bons baiser de Russie), United Artists, 1963. Ever since I was a child, I wanted to work in the auction business, specifically in the entertainment part. I liked the idea of handling, owning, and being a part of objects that were lynchpins in the history of music, film, or television. To accomplish my goal, I studied film, got an art-history degree, and earned an M.A. in fine-art valuation. I started out as a general auctioneer working with all kinds of antiques before moving into the entertainment field. I like film posters, but I don’t really collect anything myself. I buy things that I like here and there rather than specifically collecting in one category. At Bonhams, I tend to specialize more on the film side, which means costumes, props, and posters. I have a consultant-specialist who deals with the rock-and-roll side. Auction sales of entertainment memorabilia began in the 1980s. Before that, it wasn’t really a collector’s field. The whole cult of buying things associated with films has probably only existed for the past 20 years. Before that, people did collect, but not in such a wide arena. People collected, but it was just a few individuals. Finding things from the Golden Age of Hollywood, the early 1920s through the early 1930s, is difficult because people didn’t necessarily realize how important the work they were doing would be. I’m sure it was impossible to keep everything. So things that relate to the major early Hollywood styles—horror films, fantasy films, and genres like that—are much scarcer than things from more modern films. Films that have a cult status tend to be most collectible. That’s not always the case, but in the main, it tends to be. So, for modern films, some the most collectible films would be Star Wars, Princess Bride, and anything to do with Monty Python or Harry Potter. If something’s cool, it tends to be more prized. And, obviously, things related to major Hollywood icons like Marilyn Monroe are collectible. She’s got universal appeal. There aren’t really any modern-day stars that have the same sort of appeal as Marilyn Monroe. People often collect from a nostalgic point of view, and if somebody is famous now, there’s not that kind of niche for them yet. There are people who obviously collect extremely important actors like Robert De Niro, but they are not the same types of people who collect James Dean or Marilyn Monroe or Boris Karloff. Collectors Weekly: Do people tend to collect by the actor, the movie, or the type of item? Connell: It depends on the collector, really. Some people want things from specific films. They might want everything from the Indiana Jones films, for example. Other people might just want things related to James Dean and nothing else, or they might only specialize in Charlie Chaplin. Some people might have a general interest in films from the 1930s and ’40s. Others might just like film posters, regardless of what era or title they’re from. So collectors vary, from being very specialized to very broad. It’s not really a cookie-cutter, one-size-fits-all pursuit. It’s different for each person. Collectors Weekly: What are the most collectible genres or eras of cult classic film? Connell: It’s across the board, really. There are not genres or specific eras that are more collectible. A cult film could come along this year that would be equally as collectible as something that came out 30 years ago. But, of course, horror and early sci-fi are very collectible, particularly Dracula, Frankenstein, Metropolis, and early films like that. When you get to the 1940s, you get the classic films like The Outlaw, which is very collectible, and things related to the major stars of that period, such as Charlie Chaplin and Marilyn Monroe. 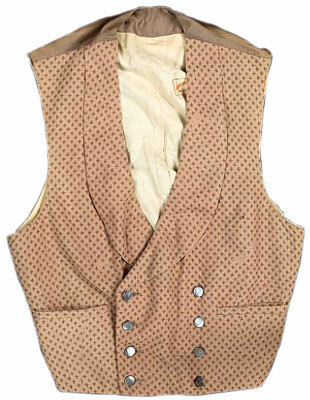 A waistcoat worn by Frank Sinatra in Can-Can, 20th Century Fox, 1960. Stamped "Western Costume Co. Hollywood, California" and labeled "Western Costume Co. Hollywood No. 2450-1, Name Frank Sinatra, Chest 37, Sleeve #2." It’s not really easy to put your finger on what’s cult and what’s not. There are certain actors and directors that have that cult status, but a film might have nobody of any particular fame in it and not be directed by anybody of any particular note, but it can still be quite collectible. Some of the most noteworthy actors are people like Boris Karloff, Peter Cushing, Christopher Lee, and Béla Lugosi. And then you get films like Gone With the Wind or anything that has had a consistent following, that wasn’t a flash in the pan. They’re still considered important, interesting, quirky, or cool now. If people still think, “Wow, that’s a really exciting actor,” or “That’s a really exciting band,” or “That’s a really exciting film,” then those are the things that are still popular because they’ve got a status that has never faded. I think a lot of actors who were once very famous have just gone off into the mists of time. They’re not really instantly recognizable anymore. But those people whose fame and status continue are the ones who tend to be collected because their importance is second to none. For example, Audrey Hepburn is very collectible because she’s still got that iconic image that has kept her in the highest echelons of fame. She’s still revered as a fashion icon of her period, and people still consider her a fashion icon today. Her image is classic. She had beautiful costumes in many of her films and she worked quite closely with the fashion industry. Audrey Hepburn was not simply an actress. She was a fashion icon, so people collect her in both the Hollywood and fashion fields. Marilyn Monroe had quite a tragic life, but she was also extremely beautiful and a very good actress. She was enormously famous at her time, and her whole romantic-tragic story has made her an icon. Earlier stars like Greta Garbo, who was also beautiful, have a certain mystique. They are interesting characters and delivered amazing acting performances, which is part of why they are so collectible. They’ve got the whole package. People immediately understand who they are and can see that they represent an era. Those are the people who become collectible. Collectors Weekly: What kinds of items associated with these people are collectible? Connell: It could be anything. It could be personal possessions, but normally things that were used on screen are more valuable because you can automatically associate them with a person. Costumes from films, props they might have used, autographs, film stills with their image, and film posters would be all the things that are normally collected. Collectors Weekly: You mentioned 1930s and ’40s cult classics. What has survived from that time period? Connell: Very little, to be honest, and I think that’s one reason they’re all in such high demand. The film posters from those times were the first to introduce a style of graphic art that became very popular later. The early film posters from the silent era are quite different from the posters made for the horror and sci-fi films. Horror and sci-fi have very graphic and eye-catching images. In terms of the stars of that era, autographs exist, but props and things like costumes are much scarcer. Mostly the things you’ll see on the market will be film posters and autographs. Collectors Weekly: What’s the most popular type of memorabilia that you see? Connell: From rock and roll, the most popular items are autographs. They’re easy to get hold of and they’re always in demand. But for film collectors, it’s probably props and costumes. 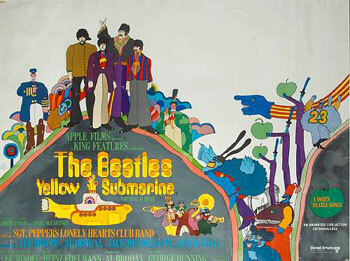 U.K. movie poster for Yellow Submarine, United Artists, 1968. We deal with a lot of different props and costumes. We had Christopher Lee’s cape from the Dracula film. That was very cool. And we’ve sold costumes from Star Wars. I really liked those. But the most common things we see are autographs. Some of the most popular music groups for collectors are the Rolling Stones, The Who, Led Zeppelin, The Beatles, Queen, Elvis Presley—again, musicians and bands whose names are still instantly recognizable now and were mega-famous in their time and are of vital importance to music history. Rock-and-roll costumes are collectible as well, but they’re much harder to get a hold of than stage costumes. There are usually several costumes used in a film. With rock and roll, stars often wear the same costume onstage during the course of the tour. About a year ago, we sold a lot of clothes that belonged to George Harrison. They were quite interesting, Indian-inspired costumes, and there was a really big interest in those. The closer the degree of separation is to the star, then the higher the value. So things owned by somebody over a long period of time that were very cherished to them would be of more value than something that was fleetingly held. A guitar that a musician played over a long period of time is going to be considerably more valuable than a guitar they played for two minutes and then gave to somebody. In the last sale, we had a table that Ringo Starr designed with another person. And we once sold John Lennon’s bath. We’ve sold really obscure things that relate to somebody, but not in a way that you would necessarily think. Collectors Weekly: I saw that you recently sold the scooter from The Who’s Quadrophenia. Connell: We did. The vendor had it for a long period of time and loved it, but they wanted to sell it. We’ve got a very strong motorcycles department here, and Quadrophenia is a very famous film, so the scooter appealed to both people who like the film and people who collect scooters. Collectors Weekly: Are items from television programs collectible? Connell: It depends on what they’re from. We’ve had several things from important cult British television programs. In the main, television is not as collectible as film or rock and roll, but if you’ve got something from Star Trek, say, then that’s always going to be highly sought after. But the majority of shows don’t have that kind of iconic quality. Television stars in general aren’t as revered or as instantly recognizable as film stars. The same is true with the programs. Collectors Weekly: The various versions of Star Trek were on for a very long period of time. Does that enduring appeal have anything to do with whether an item is collectible? 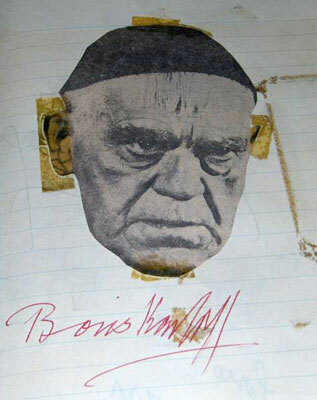 Detail of Boris Karloff's autograph from a scrapbook. Connell: Not really. There was a British program called The Prisoner that didn’t run for very long, but it was an iconic quirky British ’60s television program, so therefore it’s highly sought by fans. So it doesn’t necessarily matter if the television program was on for a long time. If it’s on for a long time and it enters the national psyche of a nation or people instantly recognize it—in America, Star Trek; in this country, Doctor Who—then it becomes part of people’s history and they relate to a part of their childhood and things like that. But it isn’t only related to how long it has been running. In this country, we have soap operas that have been on for 30 years, but that doesn’t automatically make them collectible. In the U.K., the most collectible TV show is far and away Doctor Who. It’s a sci-fi show that has been on since 1963, I think, although it was off the air for about 10 years. It has fans across the globe. There are people who buy items associated with actors who have played particular doctors, people who buy across the board, and people who only want certain episodes. We’ve sold things like Tom Baker’s scarf from when he was Doctor Who. We’ve sold full Doctor Who costumes. We’ve sold a Dalek for £30,000. There are definitely certain doctors that people prefer over others, especially the early ones like Jon Pertwee, William Hartnell, and Tom Baker. People associate them with the character and they like the costumes. By the time you get to Sylvester McCoy, who was Doctor Who in the ’80s, the popularity is much lower. That said, modern Doctor Who memorabilia is still collectible. We can sell that all day long. The same is true with James Bond. Anything that relates to James Bond, even if it’s the new Bond, has always been collectible. Collectors Weekly: James Bond is the same as with Doctor Who in that many different actors played the title part. Who are the most collectible James Bonds? Connell: In the main, Sean Connery is the most sought after, followed by Roger Moore. Timothy Dalton and Pierce Brosnan are less desirable. Sean Connery is considered the classic James Bond. His performance is held up as being the Bond performance, and he’s the person who people immediately associate with the character. Collectors Weekly: What would you say are the most collectible movies of all time? Detail of D-style one-sheet for Star Wars, 20th Century Fox, 1977. Art by Drew Struzan. Connell: Star Wars definitely, far and away. The most desirable things aren’t necessarily the most collectible because it’s difficult to get items from them. As I said, the early sci-fi and horror films are probably the most desirable, but it’s almost impossible to get a hold of things from them. Something like Gone With the Wind, you can find the film posters, but it’s difficult to get any actual props or costumes because they’re scarce. Something like Alien would always be very collectible, as well as any of the Bond films, Lawrence of Arabia, all of those kind of big blockbuster films of their time. Star Wars items come up, but not often. There are loads of fans who want all kinds of things to do with that series—toys, posters, autographs, different associated things which aren’t necessarily the original screen-used props, costumes, set designs. Those are the things that people can collect. With the earlier things, that’s the case too, but then it becomes scarcer. 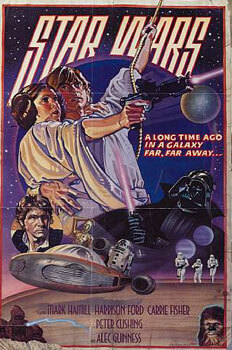 The new Star Wars movies are collectible, too, but not as much as the films from 1977 to ’81. The prices for items from the modern Star Wars films are collectible but at much less than the prices for those original productions. We sold some crazy Star Wars things. We sold some massive metal pilot seats from Star Wars: Episode I – The Phantom Menace. We’ve sold Yoda’s hand. We’ve sold Obi-Wan Kenobi’s cape. We’ve sold different uniforms from various background characters in the films, as well as villain’s pieces. Collectors Weekly: Who are some of the most collectible actors? Connell: Currently, Al Pacino and Robert De Niro are collectible. Things to do with people like Robert Redford and Clint Eastwood are, too—people whose careers have been long and important and who have been in lots of interesting productions. Then there are collectors who buy items from people with interesting but sometimes tragic stories, like River Phoenix and Heath Ledger. It’s difficult to gauge those because they haven’t been collected over as long of a period of time. For example, with Michael Jackson memorabilia, it’s quite widely available, but it’s so shortly after his tragic death that it’s difficult to fully know how his passing will affect the market. At the moment, we haven’t included anything in a sale related to him since his death. So whether or not it will be affected over a long period of time, I think it’s impossible to tell you at the minute. However, major pieces like hats, gloves, stage-worn items, and awards he received were collectible before his passing. Collectors Weekly: How much Beatles memorabilia do you see? Connell: A lot—we probably have on average at least 200 lots a sale of Beatles stuff. They are the most collected artists in rock and roll. There are a lot of collectors because many consider them the most important musical group of the modern era. We see autographs, costumes, rare records, signed records, and merchandising. They had a lot of memorabilia related to them at the time, things like clothes and packaging. They had a whole merchandising industry surrounding them, so there’s quite a broad range of Beatles objects to collect. Beatles film posters, photographs, props, and costumes are also important because they’re going to be immediately associated with the band. It’s not just simply the music. Obviously Beatles film items are never going to be worth as much as a guitar or a handwritten lyric, but they are still very collectible. Collectors Weekly: After a film is shot, is everything simply put up for sale? What’s the process? Connell: It depends on how the film operates. For a Harry Potter film, for example, Warner Bros. retains all the props to make the next film, so it hardly ever comes up for sale. It’s different from film to film. Some people sell shortly after the film. Some people sell it to dealers. Some people return it to costume houses or prop stores and don’t keep anything. So there’s not really a strict rule as to how it operates post-film. Collectors Weekly: Do designers matter to costume collectors? Connell: Sometimes designers matter if people collect particular fashion houses, but most of the time, as I said, it’s from particular films, actors, actresses, things like that. Designers can be important. If you’re collecting Jean Paul Gaultier costumes, you’ll want to buy all the costumes from The Fifth Element. But most of the time, it’s to do with the actual person playing the character rather than the designer of the costume. Collectors Weekly: If a costume is damaged during filming, does that hurt or help the collectability? Connell: If a costume is wrecked or if it’s got serious problems, then yes, I think that is going to affect the value. But if it’s the only one that exists, obviously it will still be collectible. Usually there isn’t just one costume. In a scene in which somebody is being shot, there are usually several takes—you need an outfit of them before being shot and then you’d have an outfit for them during the shooting and perhaps after. So the collector might want the costume in which the person is being shot because that is the scene they want, or they might prefer the perfect costume. Collectors Weekly: Are scripts collectible? Connell: Yes, but they need to be from important and interesting films. If you’ve got scripts that were obviously hand-annotated by a performer in a film, great, but the majority of scripts are only collectible if they are from the very top collectible films. Collectors Weekly: Have we reached a point where people are almost too aware of the potentially collectible nature of items so that they are no longer collectible? 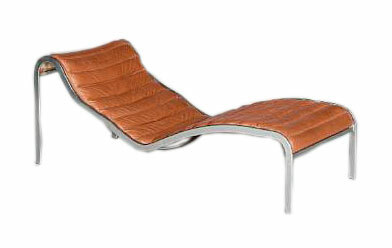 Chaise lounge used in You Only Live Twice during the scene in which James Bond meets Tiger Tanaka, United Artists, 1967. Connell: If people start madly buying things, it doesn’t necessarily mean that they are going to be revered in 10 years or 20 years, or that there’s even going to be a market for these things at all. It’s impossible to know whether or not something will be collectible. I’m sure 40 or 45 years ago, when all the Beatles merchandising was out, nobody thought anything of it—nobody thought to buy these items and preserve them in immaculate condition because it was just packaging. I don’t think Beatles items would be any less collectible if people had preserved them, but I do think they would be easier to get a hold of and therefore probably not worth quite as much. If everybody who ever bought a Star Wars toy kept it in its original packaging so that today there were thousands on the market, then obviously they would not be as scarce or unusual. But kids played with those toys. The reason people today want the immaculate, pristine, unused condition is because that’s the scarcest thing to find. Most people buy objects to use them, not to preserve them. Great article. However,I read the article for research purposes,in which it did not help. I was wondering if you could help me in my quest? I am currently a 4th year Interior Design student in Michigan and working on my final thesis paper, yet I am having trouble finding information on my topic. The topic is -The material and furnishings used to create the Hollywood Glamour era of the Golden age of Hollywood. I find hundreds of articles on Hollywood fashion but nothing on the colors, furniture, nor materials used to acheive that sleek yet polished iconic look of the era. I was wondering if you could point me in a more productive direction. Something for the boys, staring ethel merman. also roberta with music by jerome kern,lastly blossom time at davidson theater, milwaukee. how do i find out if any of these have any value. im getting to old to keep these. Was Robin Williams' Art Collection a Window on His Troubled Mind? “ ” Ceramic match holders enjoyed wide appeal because their designs tended to be in harmony with the rest of a home’s furnishings.